If you’ve wanted to know how to dehydrate apples, here’s your tutorial. We love dehydrated apples around here. They’re a great snack and store really well if you can keep them hidden so that the little people don’t eat them all up the day after you dry them! To dehydrate apples, you’ll need a few supplies. First you’ll need a dehydrator. You can use a solar dehydrator like the sun oven with drying trays if you want. I just use my Excalibur. It’s fast and easy and it holds a lot of apples. You’ll also need some apples. If you want to make your life easier you’ll need an apple peeler, corer, slicer tool and if you want your apples to look nice and not brown when they’re done you’ll want some type of food color preserver. I use Fruit Fresh, but I’ve been told you can also crush up vitamin C tablets in water or use lemon juice in water to get the same result. Ready then? Let’s get started. Step two: Assemble your helpers if you have any around. The kids usually come out of the woodwork when the apple peeler tool is getting clamped to the counter. They feed on apple peelings, so they’re perfectly content to flock to the apple peeling duty. Step three: Prepare your Fruit Fresh soaking solution. 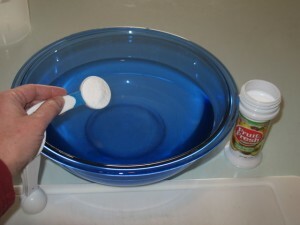 The ratio is one Tablespoon of Fruit Fresh to one quart of water. I use two quarts and two tablespoons of Fruit Fresh in a big bowl. Mix well so it dissolves in your bowl. 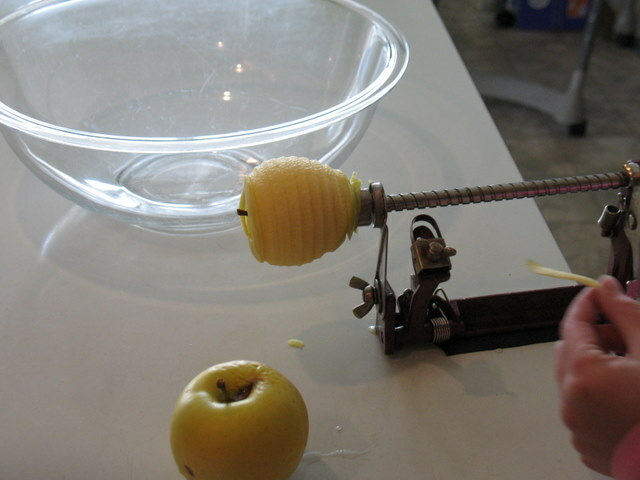 Step four: Clamp your apple peeler to the work surface and attach an apple. We use the edge of the counter. Some of these peeler/corers attach with a suction cup. I’m suspicious of suction cups so I bought one with a clamp. The suction cup ones probably work fine anyway. Step five: Have one of your helpers turn the handle on the peeler tool, sending the apple through the peeler/corer/cutter while the other helper catches the peelings to eat. 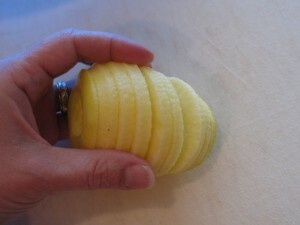 Or just send the peelings, cores, other apple scrap to the chickens or compost pile. Some folks like to save their apple peelings and make apple jelly. I keep thinking I’m going to do this, but never have. Step six: Once the apple is through the peeler tool, you have a spiral cut apple with no peel and a hole in the middle. Trim off any extra peel that didn’t come off if you want at this point. The peel doesn’t hurt you when it’s dried, it just turns out kind of hard. I prefer my dried apples with as little peel as possible. Trim off any bad parts of the apple, and cut the whole spiral in half. This leaves you with a bunch of apple half circles. Step seven: Drop the apple pieces into the bowl of Fruit Fresh solution. Separate the pieces from each other so all sides of your apple slices get exposed to the soak solution. They don’t need to be in here very long, but it also doesn’t hurt them to stay in until you’ve filled your bowl with apple slices. They do start getting soggy if you leave them in there for an hour, though. You know how I know that, right? I usually wait until the bowl is about full, then move on to step eight. 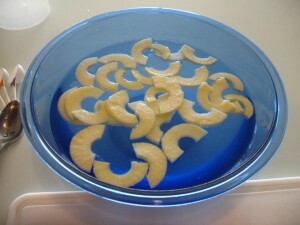 Step eight: Pull the apple slices out of the soak solution and place them on the trays. If you take just a little time and like a good puzzle, you can fit quite a few pieces on a tray. Step nine: Dehydrate at 135 degrees for 8 hours or overnight and they should be done. Now the apple eating helpers come back out of the woodwork to test the end product. Who’s been eating off the front corner already??? Variations: Different varieties of apples give you different flavor dried apples. “Delicious” varieties are fairly mild flavored, Gala or Cameo a little stronger flavor with a nice hint of tart, but tart apples are just not okay in my opinion for dehydrating! Yes, I’ve dried some Granny Smith, but they were pretty tough to eat–the sour only got more sour. You can sprinkle cinnamon or a cinnamon/sugar mixture on your apples before drying. I didn’t like this very well as the cinnamon is very dry and with the apples already being dry, I didn’t like the extra dryness of the cinnamon on them. The taste was good though. Try dipping them in apple juice after the fruit fresh solution for a little stronger flavor. If you want a sweet treat, sprinkle dry jello powder on the apples just before dehydrating. It’s a bit messy, but really tasty. Storing Dehydrated Apples: I store our dried apples in mason jars. We eat through these pretty quickly, so I have no need to store them for long term storage, but if you want to store them for longer term, you could use a FoodSaver jar sealer or an oxygen absorber in each jar to keep them fresh longer. Foodsaver bags don’t work–the apples can dry hard enough they’ll poke holes in the bags and let air in. Mylar bags with oxygen absorbers would work. They’re much stronger. You do dried apples the same as I do! You must have been lurking in my kitchen! well, except for the part about the small children and cutting the apples in half….I leave mine in rings. I also lay mine out on towels and blot off excess moisture before I put them on the trays. I LOVE my Excaliber dehydrator!!! Dried cinnamon sugar apple rings are so pretty sealed in canning jars. I stack them with a cinnamon stick in the middle. Vacuum seal and add a bow and you have an instant neighbor gift! I was able to borrow an excalibur from a friend this fall and did about 4 full dehydrators full of apples pretty much how you described-except I skipped the anti browning agent. Dehydrating is currently my favorite subject! I, like you, am leary of suction cups! Also, this post really excited me because I love apple peeling. When my mother would peel a quantity of apples, I would be right there for the peels. One day, I almost cried because she threw them out. I was a teen. Did she forget about me? From that day forward until I was in my 30s, if I were around, she would remind me, call me to come get the peels. As it turns out, the peel has something in it, forgot what, that is especially good for us…reservatol or something like that. 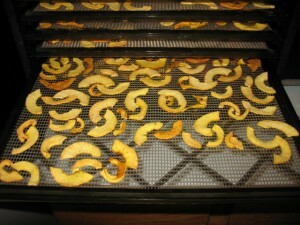 Today, I am dehydrating vegetables, frozen ones, just like on a post of yours a few days ago. These were frozen vegetables given to me in a Box of Plenty, as I named it. They would not fit in my freezer, and I remembered your post. The green beans are so crispy. They will never see RE-hydration I fear, because I intend to eat them for snacks. They are sweet. I left the peels on some apples and did not mind. My Excalibur is special to me. I just love it. I got it last year, as a gift, but when I might could have afforded it. This year, not so much!…affording it, I mean. 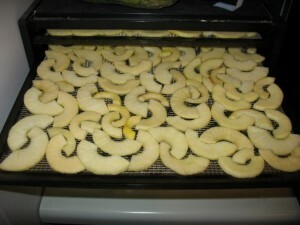 I just finished two batches of dried apples, but I didn’t peel them. Is it really necessary? 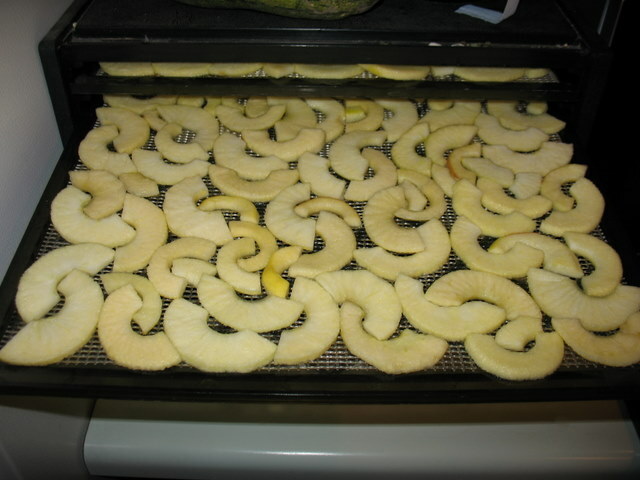 It is not necessary to peel the apples before dehydrating them. The peel dehydrates kind of tough and hard, but definitely still edible, so it’s just a preference thing whether you want to peel them or not. 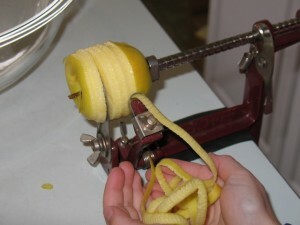 I have sooo got to get me one of those apple peeler, corer, slicers. I love it! Thanks for yet another great post! Cool, I need to try this. Do you just eat them dehydrated, or is there a way to rehydrate them back to their original state, a la putting freeze dried food in boiling water? You can rehydrate them using hot water, but they’re not crispy–better used for things like pies or baked goods or added to oatmeal. Kind of a cooked apple texture. We just eat them dry. I dont have a dehydrator at this time. I was woundering if you can use the oven at a low tem for the 8hrs? Yes, leave the oven door open a crack. It’s not quite the same product, but it works. We do a lot of cinnamon dried apples. (12 bags last week!) After the Fruit Fresh bath, I make a paste to dip the slices in. For mine, I use sugar & powdered cinnamon. Since my wife is diabetic, we make hers with Splenda. Just mix sugar (or Splenda) & powdered cinnamon to taste (we REALLY LIKE cinnamon!) and mix enough water so the you get a good coating. Too drippy? Just add more sugar. I’m wondering how this work with strawberries or orange slices? Strawberries are really good. I’ve never dried orange slices.